Meru, India's No. 1 cab service today announced the launch of a new ride sharing service, named 'CarPool' for its customers across India. 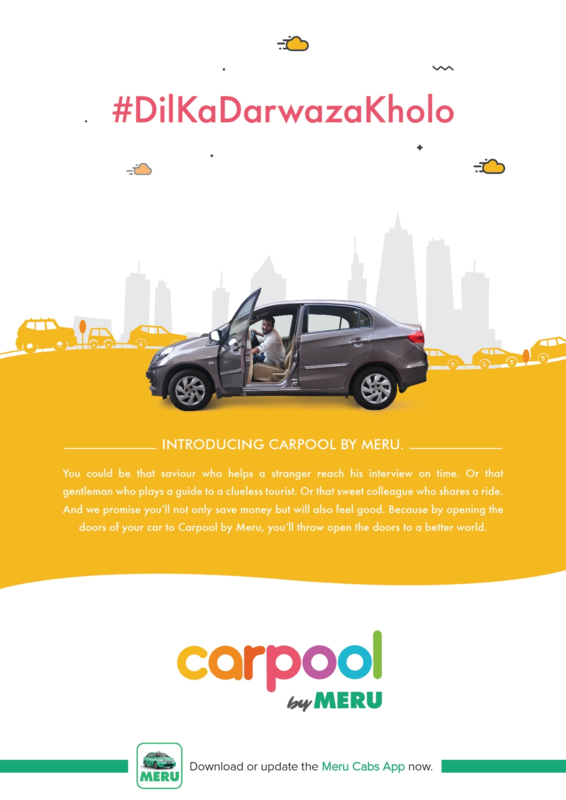 Integrated on to the 'Meru Cabs' mobile app, CarPool offers the 'Personal Car' ride sharing option for people traveling in the same direction or area. With this launch, Meru Cabs becomes the first large Indian player to enter this space. According to recent survey undertaken by Regus, a leading global workplace solutions provider, 26% of commuters in India spend over 90 minutes per day travelling to work and meetings. In addition, about 16% of all commuters drive to work on their own and on average 67% of respondents drive to work using their car, thus indicating the huge potential for carpooling among the commuters. The key benefits that CarPool by Meru will provide: Aimed at offering its customers a trusted and convenient travel option, Meru's CarPool service will enable personal vehicle owners and city commuter to reduce their daily travel costs, get an opportunity to meet new people and simplify their commute in safe & secured environment. This adds up to reduce the traffic & pollution on the city roads. CarPool by Meru also comes with a wallet partnership with the leading mobile payment service provider - Paytm to offer its customers cashless travel. Announcing the launch, Mr. Siddhartha Pahwa, CEO, Meru Cabs said, "The top 20 cities alone have over 120 million cars and the opportunity is to bring them on a popular and trusted platform like Meru. There is also a growing consciousness amongst people about the need to reduce congestion on roads, pollution/carbon foot print and stress associated with travel especially on daily traffic-heavy routes. The Carpool initiative aims to encourage a simple act of reducing the one-person per vehicle issue through a communal effort of sharing a ride with another person headed in the same direction while offering convenience and economy of travel." Mr. Amit Lakhotia, Vice President, Paytm said, "It is a great initiative by Meru. This would help the consumers to reduce their travel costs significantly as well as reduce the stress involved in travel. For some, it would help in building new acquaintances as well. Sharing economy has been growing well across the globe and we expect Indian consumers to also latch on the same. Paytm, being default choice of wallet for Indians, is glad to be a partner in providing seamless and secure payment flow." The ride payment transaction is conducted through the PayTM mobile wallet within CarPool service in Meru Cabs App. Also, Meru's ICE (in case of Emergency) feature on the app allows passengers to share details of his/her location to the registered emergency contacts. Backed by Meru's robust technology and professional service orientation, the Carpool by Meru service is currently available for all android phone users across India. The easy-to-navigate interface allows people to share or find a ride by signing in through their Facebook profile and complete the transaction via the Paytm wallet in a very seamless fashion.